1 Combine lemon juice, mascarpone, salt, pepper, and nutmeg in a bowl. Whisk to combine. 2 Bring a pot of water to boil and salt generously. Cook the pasta until al dente, taking it off the heat about 1 to 2 minutes before you would normally remove it. Drain, reserving about 1/2 cup of the pasta water. 3 Return the pasta to the pot, and set over low heat. Stir in the mascarpone sauce. Add the spinach and toss so that the spinach begins to wilt. Add about 1/4 cup of the pasta water (more if necessary) to keep the sauce fluid but not too watery. 4 Continue to cook and toss until the spinach is cooked. Add the pinenuts & brussel sprouts and stir to combine. Serve immediately. Yum!!! let me know if you try the recipe….I swear it was so tasty! I’m a very helter skeltor cook too, so I love this kind of pasta dish because you can really toss in whatever you want. I love the idea of adding mascarpone cheese—I’ll have to try that! oh good!! Do try it. You’ll love it. oh that looks SO good. i like uncomplicated dishes. i love your photos too! 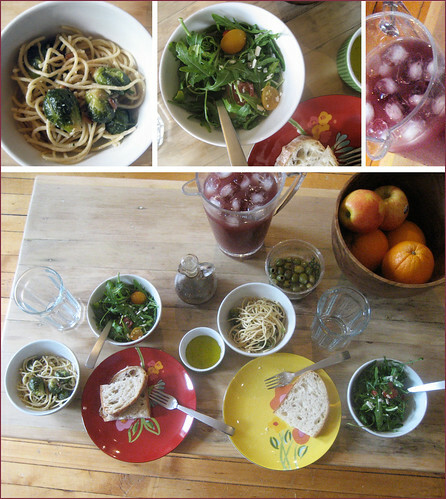 it really was so simple and so yummy…. the nutmag made it interesting. Hope you try it Yas. i’m so glad you tried it! this spread looks amazing! loved it…..gotta make it again soon. Please stop posting amazingly delicious recipes!!! Only post photos of leeks ok?